Every event is unique, but there are some fundamental elements you need to get right to make sure you have a brilliant comedy night. Here we share with your our professional tips, how to set up your night to maximise the laughter and enjoyment for all. It might seem like these things aren't important, but we know from experience how much better a comedy night is likely to be with the right set up. We want to support you having the best night possible, that's our job! Don't worry if you don't have all of these things - we can work around it, or supply you with the equipment you need. Getting the right room set up for the show is a great help for the comedy show. Make sure food (if it is being served) has been finished before the show (have you tried laughing while your mouth is full of food!)? Make sure audience are in darkness - they laugh more! 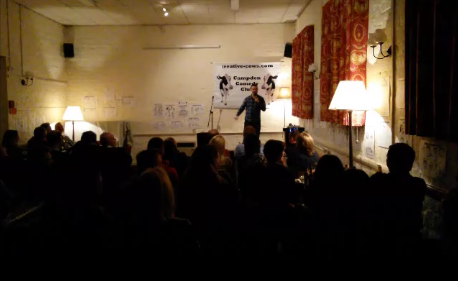 If your event is in a Pub or Club, it's best to have the comedy in a separate room, with as little background noise as possible. Serving food and drink as part of a comedy show can make the night a more attractive proposition for potential customers, so where you can offer a food package or buffet this should be considered. Make the bar available before the show and during the intervals, but close it (and make sure the audience knows it's going to be closed) during the show - this stops people getting up and down while the show is on. Where possible, food should always be served in plenty of time, long before the show starts - people can't laugh with their mouth full! If you serve food during an interval it can break up the flow of the comedy show and often means the next acts don't do as well as they could. Our advice is: Get people fed, get the tables cleared and then get the comedy started! We are happy to work around any proposed timings - this is just our advice on how to get the best out of your comedy show.